Finding samples of meaningful wedding vows that include children can inspire bridal couples to write their own. This process can be a bonding moment for your entire family. Edit sample wedding vows to reflect your new family situation and wishes for your future as a family unit. Having children participate in the vow portion of the wedding ceremony is a decision that not only the couple needs to make, but the child should be involved in as well. After all, not all wedding ideas that include children are right for every child. Does my child want to actively participate in the wedding ceremony? Is my child comfortable speaking in front of large groups? What is the current relationship between my child and spouse-to-be? Talk things over with your partner before you ask the child to participate. If your child is not interested in taking part in the wedding vows, he or she can fill other bridal party roles on the wedding day. Do not pressure a child to take part in the ceremonial vows if he or she does not want to. It will only cause stress for everyone involved, and potential feelings of resentment towards the new spouse or the parent. When children are interested in participating in the vow portion of the ceremony, you should consider letting them write wedding vows themselves. Have the child write them down to read aloud-memorizing something for such a big day puts undue pressure on the child. You can also look for modern wedding vows that include children online. Parenting forums, wedding websites, and religious resources often have sample vows on their websites. Bride/Groom: I, (name), take you, (name of spouse), to be my beloved partner in life. I promise to love, honor and cherish you until the end of time. I also commit myself to (children's names), promising to help guide you through life, during good times and bad. I promise to love and support your (mother/father) as long as we all shall live. Children: (I/We) pledge to honor the new family, brought together on this day. (I/We) promise to respect (bride/groom's names), for (she/he) has brought our (mother/father) much joy. 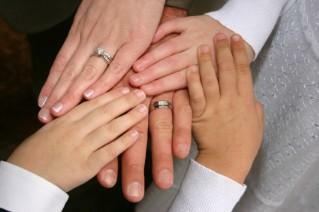 (I/We) will act with respect to our (mother/father's spouse) and will work together as a family. Everyone: Together, we promise to love and respect the newly created (last name) family, brought together in love. Poor or rich, sick or healthy, happy or sad, we commit ourselves to each other today. Let us rejoice in the happiness we have found and be a foundation of strength to one another as we establish family ties that will not be broken. One thing to note is that you do not want to mention becoming a new father or mother in the vow - unless the children themselves bring it up. You do not want to give children in a blended family the idea that you are there to replace their former parent, however the parent was lost (divorce, death, abandonment, etc.). Unlike wedding vows to include stepchildren, vows between a couple who had children together often make mention of being a parent, mother or father, to the children involved. Vows said by the bride and groom may be similar to the following:I, (name), take you, (name of spouse), to be my loving spouse. For better or worse, I pledge to you my heart and my life. As you have been a loving (mother/father) to (children's names), now let us come together as a family - mother, father, children, together from this day on. I promise to love, guide, and respect (children's names) and (spouse's name) as long as we all shall live. Kids may not want to have their own special vows, but at the same time, do not want to stand silently by. A simple vow response is ideal in this situation. Immediately after the couple says their "I do's," have the officiate read similar vows to the children. The children can then response in kind, with their own "I do." Adding wedding vows for children to your ceremony is a beautiful and symbolic way to include everyone as part of the event as your new family is brought together. They will help solidify your bond as a family.